English walnut trees (Juglans regia) are sometimes referred to as the common walnut or Persian walnut tree. They are nut-producing trees with an extensive growing region: English walnuts are indigenous to southeast Europe and yet are found growing throughout regions all the way to China. They can grow to reach heights of 60 feet with an equal spread. Plant English walnut trees in full sun and make sure you provide them plenty of room to grow. Dig planting holes for English walnut trees that are at least 18 to 20 inches in diameter and between 10 and 12 inches deep. A good planting location is one that can provide full sun and protection from strong winds. If you are planting more than one English walnut tree, space the planting holes 30 feet apart from each other. Prune off any broken branches or roots from each of the trees, if you're planting bare-root English walnut trees. Remove the English walnut tree from its growing container (if planting container-grown English walnuts). Turn the container vertically on the ground. Using a hammer, a stout block of wood or any similar object, firmly strike at the base of the container to slide the container off the root system. Loosen any compacted or encircled roots from the root ball. Set the English walnut tree into a previously dug planting hole. If you are planting ball and burlapped English walnut trees, peel back the burlap to expose half of the root ball. Spread out the roots of the English walnuts in the planting hole. Add a few shovels full of garden soil in and around the root ball of the English walnut tree. Make sure the topmost roots of the English walnut are sitting approximately 2 to 3 inches below the level of the surrounding garden soil. Scoop in more garden soil to fill the planting hole half-full of soil. Then, pour enough water into the planting hole to fill it about two-thirds full. Scoop in more garden soil to fill the planting hole full of soil after the water has dissipated. Place a 7- to 8-foot-high planting stake spaced 6 to 8 inches away from each English walnut tree. Tie the planting stake to the English walnut tree using strips of muslin, burlap or gardeners twine. To prevent sun-damage to freshly planted trees, Oregon State University recommends painting white exterior paint that has been diluted with water to a 70 percent paint solution. Use a paint brush or other applicator and paint up to the first branch. For optimum growth, Purdue University recommends planting English walnut trees in soil that is neutral to slightly alkaline. Plant English walnut trees in early winter. To ensure your English walnut trees will produce plenty of walnuts, it's a good idea to plant a pair of English walnut tree to ensure proper pollination. 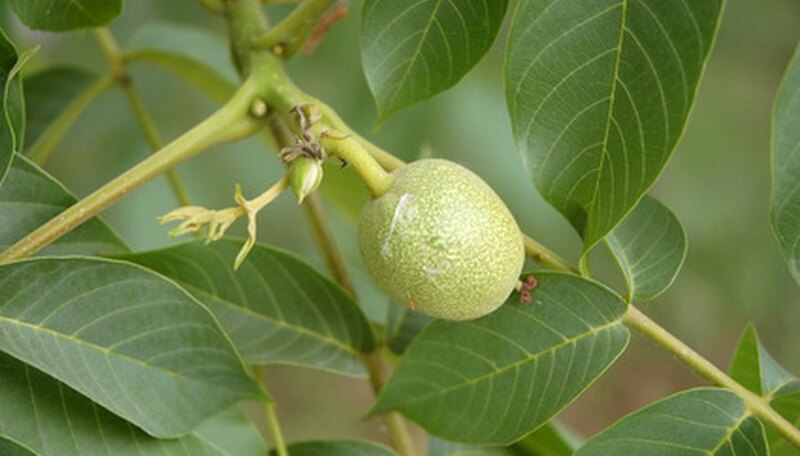 Typically, English walnut trees will begin producing approximately 5 to 6 years after planting. If you are unable to plant the walnut tree right away, bury the roots in most peat moss or sawdust until you are ready to plant.